The Dissertation Support Group is now closed. However, if interested students would like a one-on-one academic consultation, the Request for Services form is attached. Students may also be interested in our workshop on February 26th “When Writing Never Gets Done: Completing Your Paper, Thesis, or Dissertation”. Flyer and workshop application attached. This is a support group for doctoral students working on their dissertation at the Graduate Center. Students at all stages in the dissertation process are welcome. You are not alone! This is a space for you to work on your dissertation with others students and to learn practical strategies in navigating the process. 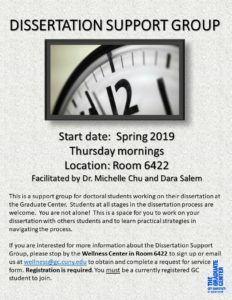 If you are interested for more information about the Dissertation Support Group, please stop by the Wellness Center in Room 6422 to sign up or email us at wellness@gc.cuny.edu to obtain and complete a request for service form (also attached for your convenience). Registration is required. You must be a currently registered GC student to join.